*Update: We still own this vehicle but it is now Courtney's daily driver. Follow along with my new build here. This is my expedition vehicle of choice. 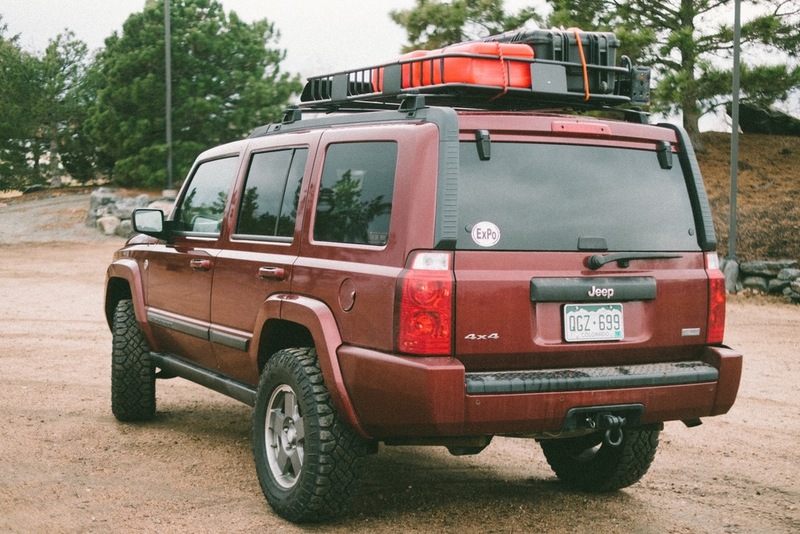 It is a 2007 Jeep Commander XK with the 4.7l V8 and QD-2 4-wheel drive system. I have a ton of modifications I still want to do to it. I want to turn it into a "go anywhere, be prepared for anything" expedition vehicle. I have made a lot of progress so far and this post is going to be a history of "Furiosa" up to this point. This is what she looked like when I got her, bone stock but still kinda cool looking. I always liked the Commanders and thought they were a bit underrated. Jeep has a long history with full-size SUV's and I thought this fit in the lineup quite well. We took our first camping trip with it after only owning it a couple of days and it did great. I then added a roof rack for some extra storage on our adventures. It didn't stay stock for too long. We quickly added a 3" Rough Country lift and 1.5" wheel spacers to get some more clearance and a better stance. It was then time to head off to Discount Tire for some new shoes. I started with 265/70 r17 Cooper Discoverer ATPs. I got a good deal on them used and they were pretty good tires. Time for some poser shots. I added a Hi-Lift jack to the rack and blacked out the grill for a cleaner look. I wasn't able to get an alignment after the lift do to some bad ball joints and I was stupid and waited way to long to fix them. I ended up wearing out the coopers in only a few months due to the bad alignment. I replaced them with some Goodyear Wrangler Duratracs of the same size and I have to say I like them so much better. They ride great, have excellent traction, and look really great too. I couldn't be happier with them. I also blacked out the center section of the bumper. Plastidip is great is it not? I picked up a large waterproof Pelican case at the Goodwill for $10. Can't beat that form some roof gear storage. I also added some paracord to the grab handles and incorporated a holder for my little Ka-Bar knife in case I need it in a hurry, mainly if I need to cut out of my seatbelt in an emergency. Well that is where she sits so far. In the near future, I plan to add a push bar, limb risers, LED lighting, a winch, a rear storage solution, rear spare tire carrier, upgraded roof rack with ladder, skid plates...and more. It will probably take me years to do everything but that is the fun of it. I will continue to enjoy what I have and keep building it into something greater.